Bathrooms are often left behind when it comes to interior decor. They’re not exactly the most public spaces of the home, so they often get swept into the category of “maybe next year” when you’re planning your home improvement projects. But did you know that a bathroom remodel is actually in the top 10 of home projects for return on investment? If your bathroom has seen better days, consider replacing the tile as part of your remodel. Tile is both the backdrop and the focal point of a bathroom, so it provides a unique opportunity to make a bold statement. In addition to being a practical way to create a waterproof surface, tile adds texture — a crucial design layer that will take your remodel beyond a simple color scheme for a more professional look. Not sure where to start? 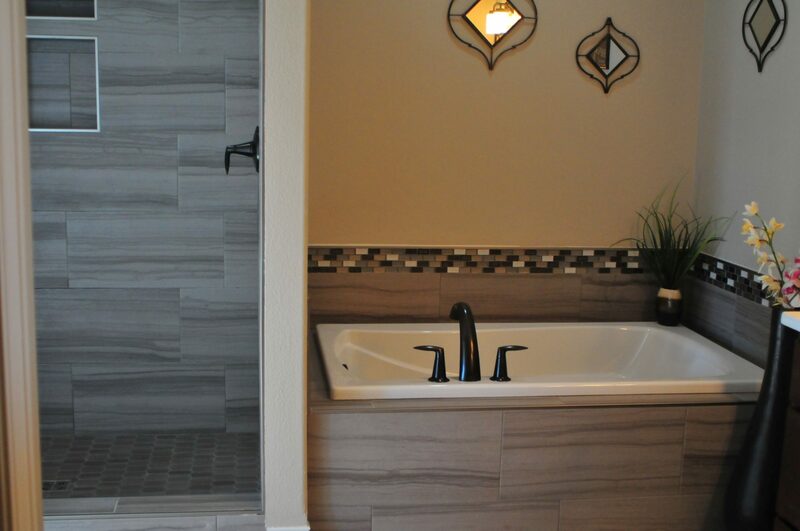 Check out these options to create different textures with your bathroom tile. When you picture bathroom tile, ceramic is probably what comes to mind. These are the glossy tiles that have been popular for decades, and they’ll provide a sleek, classic look to any bathroom. You don’t have to go with the plain square versions at your local home improvement store, though. Ceramic tiles are available in a rainbow of colors, and you can even choose painted versions to emulate Spanish style. Elongated subway tiles provide a modern update, and you can use a mix of shapes and sizes to create additional interest while maintaining a smooth finish. For a spa-like feeling in your bathroom, nothing beats the texture of stone tile. Stone tiles are made from natural materials, so they provide subtle variations in color and plenty of texture. These are perfect for creating a backdrop that’s neutral in color, and you can choose from versions that come in a matte look or have been finished with a sealer to add a bit of shine. Stone tiles add upscale flair to your bathroom design as well. If you really love natural stone, you can also consider a pebbled or river rock floor for the ultimate in natural beauty. Looking for something completely different for your bathroom? 3D wall tiles take texture to a whole new level. The tiles feature raised patterns that, when put together over the length of a wall, turn your bathroom into a subtle sculpture. Popular designs include waves, lattice, stripes and nearly endless variations on geometric themes. Some designs lend themselves to creating accent patterns within the main pattern depending on how they are arranged, so you can create a truly one-of-a-kind look for your bathroom remodel. No matter what tile you choose for your bathroom redesign, it’s always best to go with a pro when it comes to installation to protect your investment and get perfect results. When you’re ready to get started, contact Design Custom Homes to see how to get the bathroom remodel of your dreams!